The EU’s growing dependence on natural gas and Russian resources, energy security has become a hot discussion topic in academia and in policy circles in Brussels, Washington and many European capitals. However, most of the books on the subject use a very descriptive and/or normative approach and very few attempt to theorise EU energy security outside of mainstream conceptualisations of the EU as an international actor. This book closes an important gap in the literature and offers a fresh perspective on EU energy studies, and it will be an important contribution to the debate on the development of European integration and the EU’s role in international relations in the wake of the crisis in EU politics and in light of the EU’s increasingly complex external environment. Andrea Prontera is Assistant Professor of International Relations and EU Institutions and Policies, Department of Political Science, Communication and International Relations, University of Macerata, Italy. 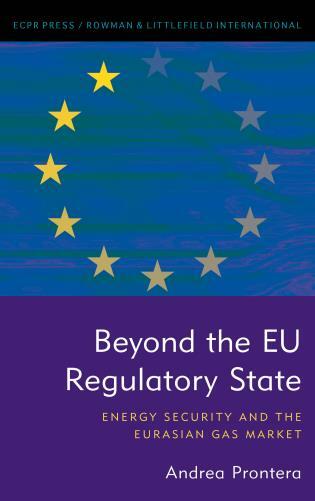 Beyond the EU Regulatory State offers a fresh and compelling approach to conceptualizing the institutions of the European Union and understanding how they promote energy security. The catalytic state model developed here provides a welcome challenge to conventional approaches to characterizing the role of the EU and promises to find useful applications in other areas of European integration. The book offers an analysis of European energy security policy going beyond the traditional realism vs. liberalism theoretical paradigm. It develops an innovative approach - focusing on the EU as Catalytic State - to investigate and understand the governance of energy policies at the European level, and in particular to assess the role of the EU as energy security actor in the regional and global scene. Prontera takes into good use some emergent lines of theorizing on the EU as a catalyst for integration processes both within the EU itself and beyond. The result is a new opening into research on EU energy security and EU external relations in general, conceptualizing the Union as a Catalytic Power Europe. Prontera shows how Catalytic Power Europe overcomes some of the limitations of alternative conceptualizations such as Normative Power Europe, Europe as a Regulatory State, or Europe as a Market Power. This approach is significant as studies on EU energy security often either lack any firm theory or utilize standard conceptions used by international organisations such as the International Energy Agency. As a result the book situates itself firmly into the emerging literature on innovative approaches on energy security. Of particular importance is how Prontera shows how the EU as a Catalytic Power not only builds and regulates the internal EU energy market, or the natural gas market that is Prontera’s focus, but also shapes the operating environment of companies and other actors within and beyond the EU. In this way EU institutions, chiefly the Commission, help to form coalitions where EU bodies interact with Member States, EU’s natural gas supplier states, energy companies within and beyond the Union, and so on. In other words, this book finds the EU not only the familiar market-maker, nor does it succumb to accusing the EU from lacking power in foreign economic relations, but rather, it analyses the EU as a facilitator. This observation has also important implications for our understanding of power in international relations and political economy. Due to its interdisciplinary features – the book combines EU studies, international affairs, political economy and energy studies – and the topics covered, this book will be of special interest to scholars of the international political economy of energy and to those interested in European politics and EU international relations.